This time it’s your former barber Ryan reporting in for one marvelous set of Remington hair clippers with vacuum! Sporting an eye-catching design, titanium-coated blades and the innovative vacuum feature, they are well worth it. I’ll expand on this in my Remington HC6550 Cordless Vacuum review shortly. But first, I want to ask you two questions. #1 What do you absolutely hate about buzzing your hair by yourself? $5 on “Man, I always have to clean up all that damn leftover hair afterwards!” was what went through your head. Let’s face it: no one likes to collect those pesky little hairs. At least if you’re a sane person, that is. #2 What would happen if you had a “vacuum” type of cordless hair clippers that collected trimmed hair? That’s a reality with the Remington HC6550 vacuum hair clippers. This baby reinvents what a cordless hair clipper is all about and the result is outstanding. As always – in the beginning let’s sum up what this blue-colored hair shaver with vacuum offers you. After that we’ll dive a bit deeper to check beneath its awesome ocean-like surface. I might sound a bit overboard with the hype around this beauty, but I do think the Remington HC6550 vacuum clipper is among the best hair clippers with vacuum function out there. It’s as simple and as effective as it sounds: this Remington cutter collects your hair as you cut it and work on your new hairstyle. After you’ve finished, you just dispose of what the “bag” has accumulated. No need to concern yourself with the dreaded thoughts of having to clean hundreds, thousands of hairs that you have mercilessly buzzed before that. Now, I’ll be honest with you – the vacuum isn’t perfect. Especially if you’re using these hair clippers when you have a lot of hair. However, in most cases it tackles the dreaded cleanup process effectively and greatly reduces the after-buzz cleanup time. 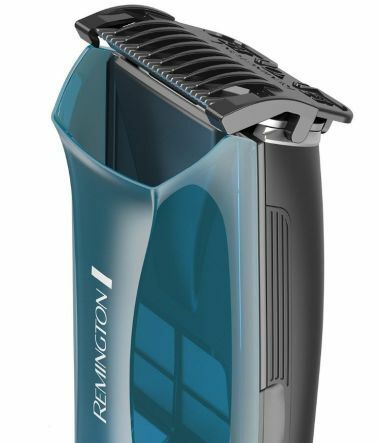 In no way professional hair trimmers (at least according to my personal assessment of the term), the Remington HC6550 vacuum clipper has a clean, presentable design. While the body of the hair cutter is made of plastic, this plastic is grade A in terms of quality. The blades are titanium-coated and cut with ease so you won’t have the HC6550 biting your hair and getting stuck. The blue color touch always reminds of the ocean and some coolness. This gets enhanced by the slight breeze coming from the vacuum fan. If you close your eyes, you will really feel as if you were on the seashore with that refreshing beauty in your hands, buzzing your hair methodically. I really like how solid the hair clippers feel. You’re in for a good grip with them and even though they can feel a bit heavy (the vacuum, remember! ), it’s not that much of a negative for me. 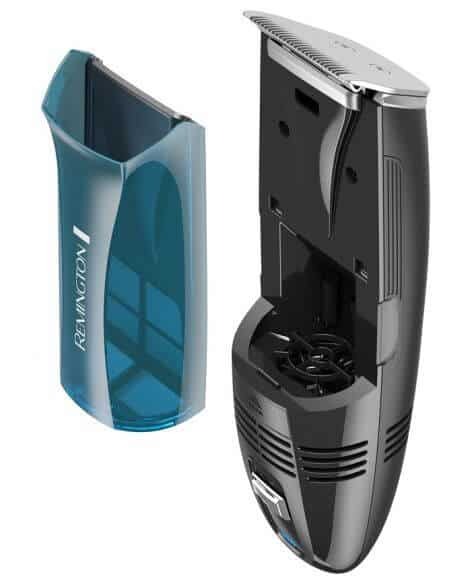 You can use these Remington hair clippers in their cordless mode, or corded. I’m a sucker for cordless hair clippers, so you can guess which one I prefer. The Lithium-Ion battery ensures you get around 60 minutes of runtime. Charging the vacuum hair clipper fully takes around 4 hours. Oiling the machine is pretty easy – you just open it up with a click. You will need to do this from time to time. But hey – that’s a quality mens hair clipper we’re talking about. All of these need some respect and care as confirmed in this Remington HC6550 Cordless Vacuum review! 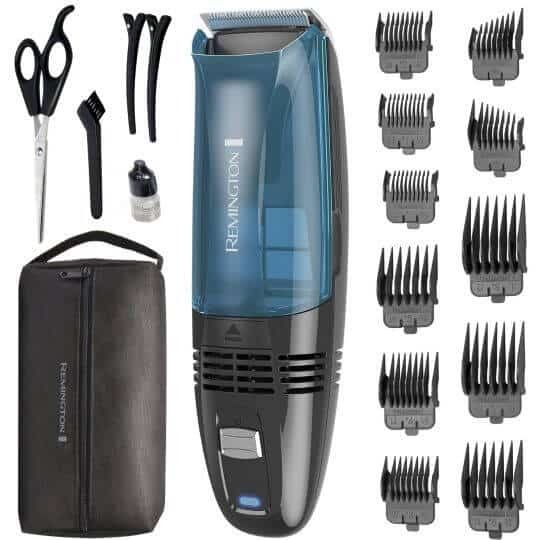 The cordless hair clippers come with a 18-piece kit included. You got your usual suspects here – length-adjusting combs, quality blade oil, cleaning brush, even barber scissors thrown in the mix. 11 combs are all you need to get your buzz game on. As I mentioned earlier, one of the Remington HC6550 vacuum clipper’s bad points is that the blades don’t cut that close without you using the attachments. Depending on your hair preferences, you need to be careful. Also, beard trimming can be a thing with these hair clippers, but I’d be even more careful with that. Better stick to your hair, even though the longer attachments might work with beards just fine. Haven’t experimented with this so I can’t vouch here. The 18-piece set of accessories has one drawback and that’s the pouch. Now, it’s very convenient as you can put everything in one place, but… I just don’t like it. I can’t even elaborate on why, but compared with the clean design of the Remington HC6550, this pouch just doesn’t sit right. You look for medium-budget ($40 to $70) hair clipper of solid quality. You need casual rather than professional hair clippers. You hate the hair clutter and mess after crafting your new haircut. You like the versatility and comfort of cordless hair clippers as much as me.